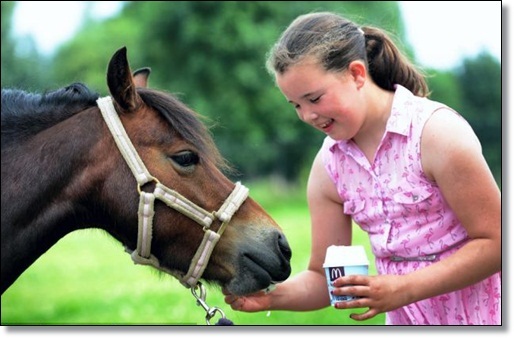 A mother who was fined after her daughter took her pony into McDonald's claims that the pet has previously been served plenty of times - and has a fondness for a McFlurry. Christine McGrail and daughter Olivia were told to tie up their steeds after being forbidden from using the drive-through service at the fast-food restaurant in Whitefield. Managers at the franchise told Christine, 33, who was riding stallion Dancer, and her nine-year-old girl, on pony Minnie, they weren't allowed to queue with waiting cars. Christine McGrail and daughter Olivia took the pony into the McDonalds so they could pick up a snack. Christine McGrail and daughter Olivia were told to tie up their steeds after trying to use the drive-through service at the fast-food restaurant in Whitefield. Ride-thru: The woman and her daughter attempted to use the drive-thru at McDonald's before taking a horse inside. The mother says she took managers "iterally" when they suggested the pair dismount and enter the store. 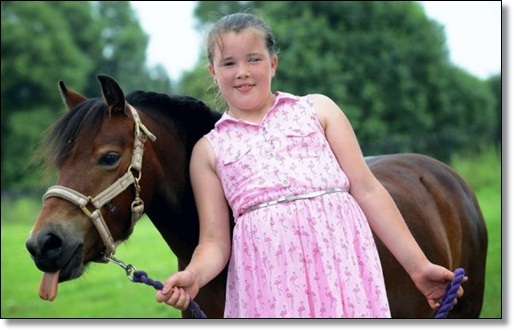 So she let Olivia lead her six-year-old pony into the restaurant - to the amazement of customers. But once inside, Minnie defecated on the floor and police were called. 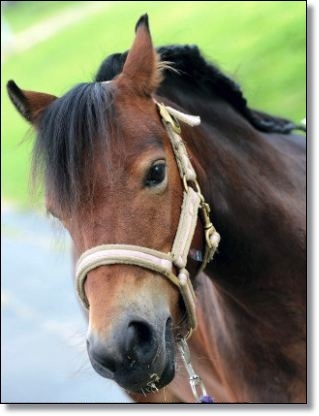 The mother-of-one admits she acted 'rashly' after the pony opened its bowels in front of diners but claimed the treatment of horse riders was inconsistent. She said: "Minnie likes McFlurrys. We've genuinely been served several times before and I didn't think using he drive-through would be a problem." She said that Minnie, who defecated on the floor of the store, had a taste for the ice cream treats. An officer issued Christine with a £90 fine for causing "alarm and distress" to customers and managers have also banned her. A statement posted by Greater Manchester Police’s Whitefield branch on its Facebook page said they received a call from McDonalds. It added: 'The staff refused to serve the women due to company policy. The women then took the horse into the restaurant who ended up doing his business on the floor. 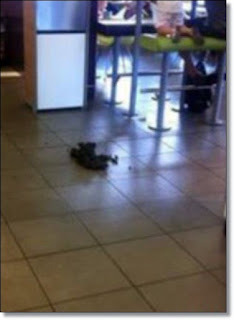 Not so happy meal: Staff and customers at the branch of McDonalds were distressed after the horse defecated inside the restaurant. The sight and smell of this caused obvious distress and upset to customers trying to eat, as well as staff members. Officers arrived at the location and woman was issued a Fixed Penalty notice. 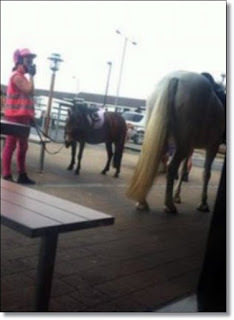 A spokesman for McDonald’s said: "I can confirm that on 20th July a woman allowed her pony to enter our restaurant in Whitefield after being refused service in the drive-thru lane." The incident caused distress to customers and disruption for the restaurant and the police issued the woman with a Fixed Penalty notice. The health safety of our customers and staff is our top priority and for this reason we are unable to serve pedestrians, bicycle riders or customers on horseback through the drive-thru. The policy was introduced over fears that safety of staff and customers could be put at risk if a horse is spooked by a car. The company said they would not be releasing CCTV footage of the incident.